Today I have another one of my former favorites to share with you. This card is probably one of my all-time favorites from my Clean and Simple cards and there's not even a single stamp on it! 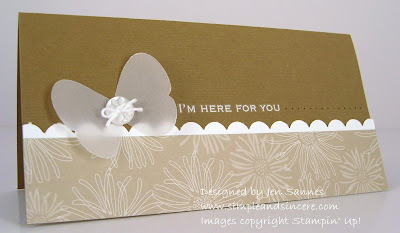 That vellum butterfly and button were so fun to put together. You can view my original post here. Very cute card, Jen. Love the vellum butterfly. The card is clean and crisp. Very nice! It's simply gorgeous! very nice. This is beautiful, Jen! I really love your work! Thanks for sharing! I LOVE the simple beauty of this card!